After a friend referred Mary to Charles S. Thompson, M.D., F.A.C.S., a board-certified vascular surgeon at Vascular Specialists of Central Florida, her life changed. 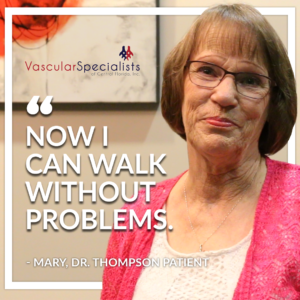 Before meeting Dr. Thompson, Mary couldn’t walk very much on her own due to the pain caused by peripheral artery disease (PAD). Peripheral artery disease (PAD), is a condition in which blockages appear in the arteries that carry nutrient-rich blood to the head, organs, and limbs. PAD most commonly occurs in the arteries of the leg. When gummy plaque builds up in the arteries (a process known as atherosclerosis), it can thicken over time and impede blood flow to the vital organs and limbs, leading to leg pain and problems with walking. As it progresses, the blockages can get worse, resulting in pain at night, as well as ulcers that don’t heal properly. Many people who have PAD do not experience any signs or symptoms. For those who do, they may feel discomfort, numbness, and aches in the legs or they may experience cramping in the legs, hips, buttocks or feet, particularly while walking or climbing stairs. Symptoms usually subside with rest. An unhealed ulcer on the toes can signify the development of PAD. Untreated ulcers can lead to gangrene, and therefore, need urgent medical attention. Treatment for peripheral arterial disease can be medical or interventional. Medical treatment emphasizes alleviating symptoms and stopping any further development of the condition. Advanced treatments for treating more serious symptoms involve removing or opening up the blockages in the arteries, which enhances blood flow to the legs. This can be achieved through balloon angioplasty, placement of a stent (a small mesh tube), or surgical bypass. Grateful for reclaiming her life and living pain-free, Mary emphatically recommends Dr. Thompson to anyone suffering from what she went through.